0.0 The first parking lot at the start is small and may fill -- there is additional parking further down the island. 13.8 Unlike previous versions of YARRR, we stay on the rail trail and navigate through the town park, re-entering the woods and following the trail again, until Flint Hill Rd. If you follow the old route you'll climb a few unnecessary hills and possibly be DQed should there be a secret controle in that town park. 33.4 The right onto rt 29 is easy, but the two subsequent lefts are difficult, uphill, cross-traffic turns. Don't be too proud to dismount and cross on foot if necessary. 40.1 Fresh chip seal on Reifsnyder Rd -- not to bad, but be careful on turns. 53.5, 54.1 Quarry Rd and Wall St. These are downhill right turns that are NOT at the bottom of the hill. Both are easy -- and painful -- to miss. The Wall St sign is hidden by trees. 58.9 Artisans Cafe was closed. They should be open on Saturday but as this is an open controle, feel free to choose another place. James H reported that the place next to Artisan's has excellent iced kombucha. 74.6 The first left after Bunton Rd is unmarked and looks like a private road into a park -- because it is. It's really the first feasible left. The cue is accurate in my opinion. Don't miss it or you'll have a painful merge onto busy Rt 63. 80, 82.1 The Wawa is not a controle, but you may want to stop here for water. Don't eat too much or you'll spoil your appetite for dessert at Sundae School just 2.1 miles further. 84 Where Branch Rd crosses Schwenksmill we observed paving in progress. You should have a nice new paved section of Branch to ride on by Saturday. If, however, Branch is blocked, navigate North (left) to 5th street, cross 313, and then navigate south on Old Bethlehem to rejoin the course turning left at Sweetbriar. 108.2 Delaware River Fish and Boat access ramp. Excellent for a refreshing swim. By the time you walk across the bridge you'll stop dripping and won't leave wet footprints around Milford Market. 124.7 Jimmy's at the finish controle has ice cream, doggies, and other decent food. Across the street by the river is the outdoor Sand Bar pavillion that has cold beer. If you don't see the finish controle volunteer at Jimmy's, check at the Bar. A pre-ride was conducted on 30 June by James Haddad. He reports the course is in good shape. Cue sheet and RWGPS on the event page have been updated to reflect his observations. Several of the bridge closures that required detours in previous versions of YARRR have been eliminated. The infamous Keim St bridge in Potstown is exactly in the state we left it last year -- maybe some more rust and weeds. The construction/demolition they have been threatening is still motionless. Thus, with positive waves we expect these bridges to be there on Saturday. Enjoy a somewhat shorter route! Well, not all the bridges were OK. A bridge at about mile 72 near Fourty-Foot Rd is out, out. No bridge, just creek. James decided to ford the creek, which seemed to him like a great idea in the 90+ temps last Saturday. In case biking through creeks is not something you want to try, the latest cue sheet incorporates a simple detour. There are several rail trail segments in this ride. The first one you encounter is in Hellertown. In past versions of YARRR, we exited the trail early to avoid some confusion near a town park beginning at mile 13.8. In this version, we transit the park to stay on the trail all the way to Flint Hill, thus avoiding several small climbs. The confusion in the town park seems more manageable now. Signs and paved paths have been added. You proceed generally on the left side of the parks and fields and eventually the trail returns to the woods. Cues and RWGPS have been updated to guide you through the park. Given the expected heat, you will need more than just the controles for cooling and hydrating supplies. Consider using the fountain at Evansburg, mile 68.3, Wawa at mile 80, and the Milford Market at mile 108. Given the probability of very hot weather for the YARRR 200K on 7 July, I have moved up the start time to 6AM, the earliest we can reasonably start from Hugh Moore Park. This will save an hour of riding in the heat. For the R-12 series on 7 July we will be running the much preferred counter-clockwise version of the YARRR 200K brevet with all the difficult climbs incorporated into the first 100K during cool morning hours. The second half, ridden in the heat of the day, mostly uses moderate, shady roads along creeks, and finally along the Delaware. 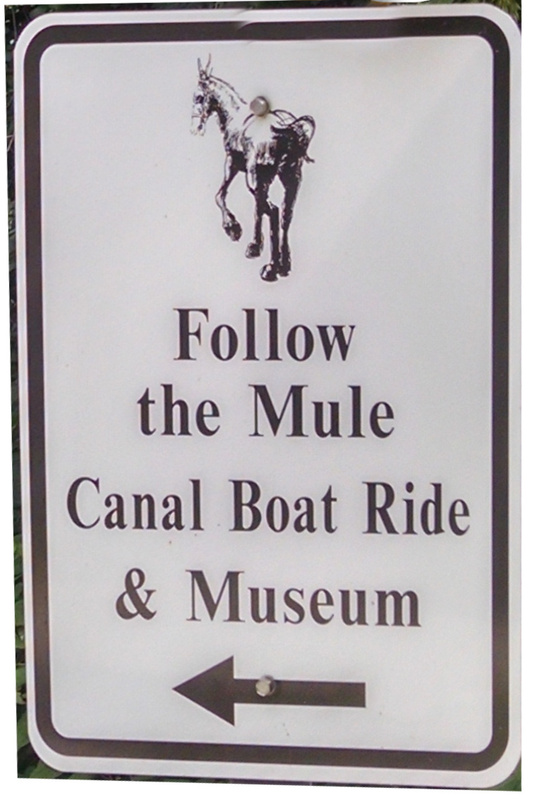 You'll visit three rivers, traveling from an island in the Lehigh, to the Schuylkill, to the Delaware. Along the way there are numerous food and drink options, and points of interest. The finish controle, at Jimmy's Doggie Stand, has readily available ice cream and cool beverages. Event details are posted at the PA Randonneurs web site. Parking at the start is the lot on Hugh Moore Park island in the Lehigh River, home of the National Canal Museum. Many previous PA Rando brevets pass by this location, so it should look familiar. Nevertheless, if this is the first time you've driven to Hugh Moore Park as a start controle, consider that it may be difficult to find, so be sure to allot a little extra time. The entrance to the park is an iron bridge that T's onto Lehigh Drive. There are no food services at Hugh Moore Park. The nearest 24 hour Diner is the Key City Diner 985 US-22, Phillipsburg, NJ. There's a 24 hour Wawa in Easton at 310 Larry Holmes Dr. Alternatively, stop for something in Hellertown at about mile 10. The cue sheet for this ride is long. This complexity was made necessary by the difficulty navigating through suburbia. Nevertheless, the cue sheet provides the official course directions. GPS routing is known to fail or be unsafe at several places along this course. Please refer to the cue sheet as your canonical authority. Starting from the National Canal Museum parking lot on an island in the Lehigh River, the climbing begins immediately as you head up over South Mountain. 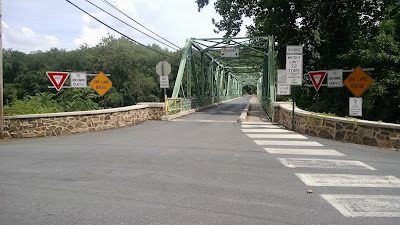 After descending the mountain, the route is generally flat through Hellertown, including a few miles of crushed stone rail trail (suitable for most tires). 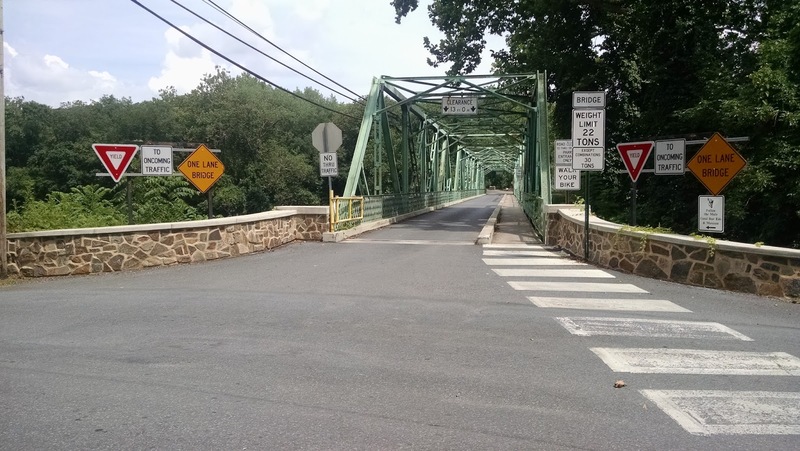 Upon reaching Coopersburg, you'll return to climbing mode through several bumpy areas before reaching the new controle (a super Wawa) in downtown Pottstown, and the Schuylkill River. Here the course turns South East, following the Schuylkill on mildly rolling terrain to the Artisan's Coffee controle in downtown Phoenixville. Now you turn to the North East, climbing away from the river on "Level Road" till the terrain moderates through the heart of Bucks and Montgomery counties, including some paved trails in Evansburg State Park. Soon thereafter you will find yourself on familiar randoneuring roads approaching the info controle at Erwinna, where the course turns North West along the Delaware river for an easy riverside spin back to the finish controle at Jimmy's Doggie Stand near the Free Bridge over the Delaware between Philipsburg and Easton. After handing in your brevet card and replenishing at Jimmy's, there's a short, flat ride back through downtown Easton (and yet other replenishment options) to return to your car at Hugh Moore Park. - Summer weather has arrived with a vengeance with a forecast calling for heat and humidity. Be mindful of your fluid and electrolyte levels and it might also be a good idea to carry an ice sock with you if you need to cool down. - With the rough winter we just had you should be extra vigilant for potholes and rough road surfaces. - Please note that the bike inspection checklist includes redundant lighting for both the front and rear lights. Please let me know of any corrections or changes necessary. These results will be submitted to RUSA in a few days and will become official pending ACP certification. Congratulations and many thanks to long-time PA Rando regular and now first-time event organizer Bill Fischer for handling the duties for the Hawk's Nest 200. Any brevet resulting in a 100% finish rate and 0% emergency RBA call is successful in my book. If you aren't aware, Bill sandwiched the inaugural Blue Ride to Bay 1200k in between his course check-out ride on Memorial Day weekend and the Hawk's Nest 200. Knowing Bill, I'm certain he would have enjoyed riding again yesterday just as much. It was a great day for a ride. Sixteen riders clipped in for the start and all sixteen returned for a 100% completion on the day. Many new folks joined us for this beautiful ride in the Poconos, up through Canadensis and Promised Land to Lake Wallenpaupak before leisurely working their way down along the Lakawaxan and Delaware Rivers back to the Village Farmer & Bakery (Apple Pie Deli) for their delicious fresh smoked barbecue. Congratulations to newly minted randonneurs Robin Rootkin and Darryl Southwood as well as first-time PA brevet finishers Brian Hanson-Harding, Jim Vreeland, and Oliver Zong. The weather cooperated and several of those riding last weekend’s events in NJ and DC commented it was nice to be able to finish a ride in dry gear. Temperature were in the mid-70s and between the shade coverage provided by the vegetation in the Poconos and the late afternoon cloud coverage, riders were treated to relatively mild Summer (Late-Spring) riding conditions. The ascent up Old Mine Road was still marked by the rough road surface from multiple years of superficial patching but riders noted that the loose gravel on the initial steep pitches was noticeably missing. As it was still on the upper, more level top of the climb it was concluded that all of the rain this Spring may have washed the gravel off this section. Those that weren't too busy watching the road apparently spent a lot of time nature watching. Tim Creyts writes, Thanks to all the volunteers and organizers who made yesterday's ride run smoothly. That was a great day for riding. One if the highlights of the ride for me was the porcupine crossing Old Mine Road (yes, it was alive) and a mile or two farther down the road, a quail hen and her chicks crossed in front of me. (Not so secretly, I am envious of Don Jagel's bobcat sighting). Bill Olsen observed, I saw a turkey hen w/ about 8 chicks. When she saw me she stopped and squatted down in the grass. I could still see her but the chicks disappeared in the grass. Two riders completed the route on fixed gears: James Haddad and Rudi Mayr. James reports, Joe and Greg we behind us for a little bit (then they blew past us) and commented that it was hysterical watching us, Rudi was riding ~67 gear inches and I am riding ~55 inches prepping for some hilly rides, I was spinning out of control on everything that wasn't a climb. Congrats to you both! It's not the worst, but it's far from the most fixie-friendly route in the PA Rando catalog. Under the heading of Rando Camaraderie comes this story from CJ Arayata. In the haze that was post-Hawks Nest, my partner and I managed to forget the dynamo front wheel to our tandem in the Park-N-Ride lot. I don't think there are any extremely close randos in the area, and I don't have much hope, but does anyone know anyone that might be able to swing by and potentially retrieve? He posted his plea early Sunday morning and by mid-day, local rando Scott Steingart who lives in nearby East Stroudsburg had retrieved the forgotten wheel. Next up we head to Easton for the Yet Another River to River Ride 200k organized by Chris Nadovich on July 7. Event details are on the website. Registration will open soon.